On Friday, I handed in my badge, walked through the turnstiles, and didn’t look back. Now I’m fully committed to spreading the practice of Working Out Loud. It’s exciting and daunting at the same time. Here’s what happened and what I intend to do next. I’ve worked in big companies for 30 years, mostly in banks. If I had lost my job ten years ago, my only option would have been to ask a recruiter for help finding a similar one. As I started working out loud, things changed. Over time, I developed a network of meaningful relationships I never could imagined before. The connections gave me access to learning and to opportunities, and made each day feel a bit better. The last few years have been a kind of goal-oriented exploration - “purposeful discovery” - that has expanded my sense of what’s possible. By working out loud, I’ve learned that I can do and be much more. Working at a big firm isn’t necessarily bad. I appreciate the many talented people I met and friends I made, and the chance to experiment on a large, global platform. I learned a lot and I’m grateful, and I will certainly miss the predictability of a paycheck every two weeks. But the culture, processes, and systems at so many large organizations depress people’s ability to contribute and realize their potential. It’s a tragic waste and it needs to change. So now is the time for me to take a step. It’s time to fully commit to helping individuals and organizations unlock more possibilities and realize more of their own potential. Help might be in the form of giving a talk at your organization. Or the online training for circles launching on June 9th. Or creating a customized development program that can help your firm and all the people in it. 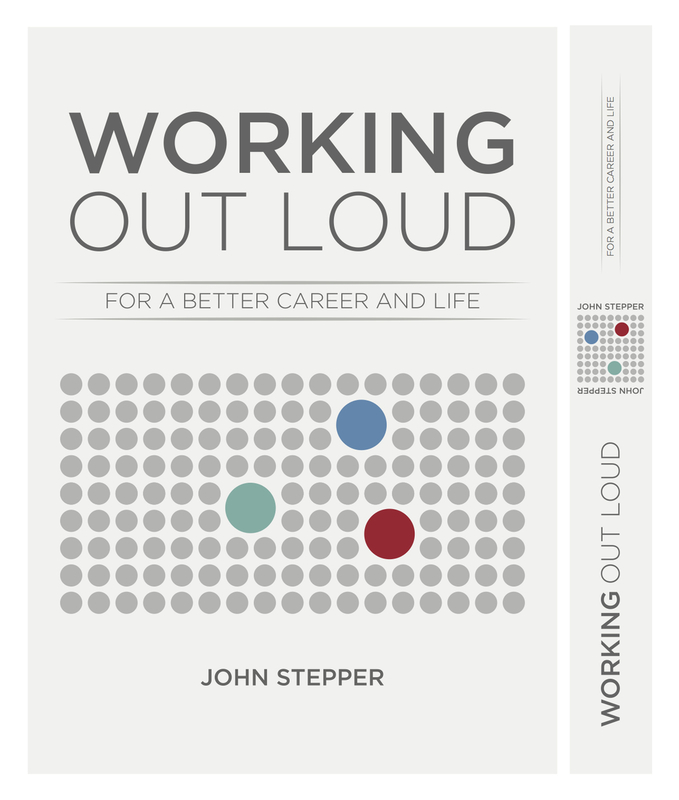 If I can help you or your organization realize your potential, please contact me at john.stepper@workingoutloud.com. A highlight of my day is seeing messages from people who find Working Out Loud helpful in some way. Here are a few from Twitter. They’re written by people who’ve changed in some way - a heightened sense of empowerment or hope, a new outlook. They write them because they feel more positive and want to share that feeling. It's beautiful to see. As you spread the practice, you’re helping more people experience this. Earlier this week, I met with a Working Out Loud circle in Japan, the first one there. We talked about their goals and the relationships they were building, and about the exercises they had done. As they approached the end of their 12 weeks together, they wanted to know if they had done things right, and what to do next. You’ll know you’ve succeeded in a circle if you’ve changed your mindset in some way and taken some action you wouldn’t have taken otherwise. We didn’t talk about the number of people in their network or the amount of social media activity. We talked about their goals and steps they were taking toward them, and about how they felt. The conversation with the circle in Japan is similar to those I’ve had with many other groups. When circles work, people say they feel “like their world is bigger” or that they are “more empowered and encouraged.” A new mindset and new habits is a powerful combination. Not all circles work this way. Some have trouble just organizing the first meeting, or having everyone show up. Others find the 12 weeks too long, or that an hour a week is too much. They’re not doing anything wrong. People are busy, and getting a group together can be a challenge. Even if you want to take steps toward a goal you care about, it can feel easier to just keep doing what you’re doing. Each circle that doesn’t work is an opportunity to learn. So in 2016, we’ll collect these experiences in a more systematic way and use that data to make the circle experience even easier and more effective. What’s happens after 12 weeks? One of the questions the group in Japan had was about what to do next. Should they keep going as a circle? Did it make sense to use the same guides again? I told them I’m on my seventh circle now, and I find that including different people each time helps bring new energy and perspectives to my goal. The structure and shared accountability of the process helps me take the steps I need to take. I described how I use the same guides because sometimes my goal is different and so the entire process applies. Even when my goal is unchanged, I get a chance to practice the different steps and exercises and approach them differently now that I have more experience. The first circle in Japan did beautifully and experienced a wide range of successes they can now apply to other goals. They agreed that next year they’ll form new circles, helping themselves and others take a next step. Note: The next post will be on January 6th, 2016. Enjoy the holidays! She’s a much-beloved piano teacher, and she’s extremely good at what she does. Her playing, too, is extraordinary. And yet, one night as a group of us were talking about work, she said something that surprised me. She’s so popular that I found it hard to believe. She told us she wanted something more than teaching, that she yearned for interactions with people besides the familiar students and their families. We talked further and I offered her a copy of Working Out Loud. I thought perhaps she could build relationships with other teachers and feel more connected. I wasn’t sure. A month later, she was carrying the book with her and it was marked with multi-colored tabs. It turns out she had been wanting to do more original compositions and the book helped her. She did a few simple exercises, started searching for composers, and began interacting with a few of them. “You already made my world bigger,” she said. Of course, I hadn’t done anything. She was the one brave enough to take a step. Now we’re in a Working Out Loud circle together, and she’s learning about scoring music for movies and getting in touch with independent film makers. Who will you help? What step will you take toward your own goal? An unexpected benefit, an unexpected gift. I do it everywhere now. Over lunch or coffee at work. During dinner parties. In the elevator and even on Twitter. “You should form a Working Out Loud circle,” I’ll say. It’s not to promote Working Out Loud or even circles but to share a feeling. Because I’ve seen such positive experiences in the peer support groups, I want to help others have the same feelings I've had. My own experience is that being part of a circle for 12 weeks gives me the encouragement, support, structure, and shared accountability to help me actually do things I know are good for me. What I didn’t expect is that I would make friends. I barely knew the people in my circle. Some I had never met. Yet as we shared our goals and fears, our successes and our weaknesses, we naturally grew closer. We became increasingly invested in each other’s success and each other’s happiness. The circle helped me feel positive, connected, and empowered. "After just one WOL Circle meeting, I was already feeling more connected with my colleagues and more encouraged about my career." One group of 5 young women invited me to meet with them after their 12 weeks. They were going to dinner together that night (a “graduation” dinner like my own circle had). Some of the women will be going off to graduate school, and they talked about how they had become friends and will stay in touch. They also mentioned that they'll form circles again with other people and other goals. Each of them had developed a network toward an individual goal while also developing new skills and new friendships. My toughest critic is my wife, as evidenced by her candor when she first read a final draft of the book late last year. That led to a major rewrite and a much better book 6 months later. So I was pleasantly surprised when, at a lunch with one of my daughter’s teachers, my wife started telling her about working out loud and about circles. The woman is a wonderful person and extremely talented, and my wife wanted to help her discover more opportunities. A similar thing happened with another friend. We gave our daughter's teacher a book the next day. Our friend will be part of my next circle. The working out loud stories I tell are about very different people. Different ages and experiences. Different education levels. Introverts and extroverts. What they have in common is an open, generous, connected approach to work and life. Which of these people is most like you? The simplest goal is when you want something more from work or life but you’re not sure what it is exactly. You want to take a few steps and see where they may take you. David had shelved his dreams of authoring children’s book and wanted to breathe life back into those dreams. After five years, with help from his working out loud circle, he started writing again. Barbara managed to connect her job with something else she was passionate about and felt “working out loud changed my life.” Later on, her contributions online at work led to a new job in a new city. Some people have a clear idea of what they need to do. Mara wanted to move back home to New Zealand. As she deepened relationships with people there, she increased her odds of finding a job. And by taking control she felt less anxious about the entire process. Today she sends me photos of the pristine beach she runs on in the morning. Nicola, whose story I’ll write soon, is an entrepreneur looking to expand her business. Exploring ways to frame what she does as a contribution makes her view networking and business development in a much more positive light, as something she can do in an authentic way that’s more comfortable for her. For many people, the goal is to find a new job or to change careers entirely. When Joyce, with decades of experience, was looking for a new challenge, she didn’t recede into the background or just rely on friends and family for access to existing jobs. Instead, she channeled her energy into purposeful discovery – learning, experimenting, meeting people, contributing. By making all of that visible using social platforms, she turned those experiences into new and more fulfilling possibilities, including teaching and forming a new company. My own experience was similar to Joyce’s. When my area was reorganized and I was on the brink of being laid off, I was able to discover my passion and connect it with a new career all while staying in the same firm. In addition to enjoying every day more, I now have more control and more possibilities than ever. Someone I often talk about - and who merited an entire chapter in Working Out Loud - is Anne-Marie. At 24 years old, she founded Stemettes, a movement that's "showing the next generation that girls do science too." Her approach to work has made it possible for her to build an extraordinary alliance of partners, raise a significant amount of money, and help a growing number of young women. Anne-Marie isn’t lucky. She makes her own luck. I also like to tell the story of Jordi Muñoz because it shows how even someone with seemingly few opportunities can change their odds. When Jordi was 19, he was waiting for his green card, wasn’t in college, and found out he was going to be a father. Five years later he was CEO of 3D Robotics. Working out loud isn’t just for people in big companies. It’s for anyone who thinks there could be more to work and life. This post includes just a few of the stories I ultimately hope to share. As more people form working out loud circles, I’ll be looking to publish their stories on this blog and in a next edition of the book. Working out loud - thinking of your goals in terms of people and contributions - is a mindset that can change your life. What story will you write for yourself? She stopped, paralyzed for a moment. “I don’t know why,” she said. The friend I was talking with is smart, creative, and extremely capable. What’s holding her back? It’s the same set of things that prevent any of us from making a concerted effort towards something we truly want. The magnitude of the change. The prospect of potential failure. I could see how her beaming expression had turned to one of fear and uncertainty. “You could take a small step,” I suggested. My friend’s goal is ideally suited for a Working Out Loud circle. It’s what we refer to as “purposeful discovery.” Of course she won’t be sure of what job she wants exactly or how to get it, but she’ll take small steps towards exploring and learning. That discovery starts with 3 questions. People she knows who live there. People who hold senior positions in companies there. People who have similar jobs to her in similar companies. People she knows who have connections there. People who write about that location. Organizations whose purpose is related to that location, from chambers of commerce to tourism to conference organizers. What can I contribute to deepen our relationship? She’ll start with the universal gifts of recognition and appreciation. For each person on her list, she’ll look for their online presence and, when she sees something she likes, she’ll let them know by following or commenting. Gradually, as she learns who and what she finds interesting, she’ll make more significant contributions that will be of more value both to her and the people in her growing network. That will lead to more connections, more learning, and more possibilities. Dreams can be scary for all of us. Even the simple dream of being in good physical shape eludes many people. The prospect of exercising regularly is too daunting so we do nothing. Instead, touch the treadmill. Break down your dream into something so small it won’t trigger your defenses - and thus allows you to make progress toward it. Start with a simple learning goal and with a few people who might be able to help. Practice making small contributions to them and ultimately framing your work as a contribution. Let the power of social networks amplify who you are and what you do. Leverage the tools and existing networks to extend your reach, multiply the kinds of contributions you can make, and allow you to deliver them conveniently. The start of something big andwonderful requires that you take a first step, no matter how small. Start. Improve your odds of experiencing a better career and life.